Travel to Namibia’s Skeleton Coast and Kaokoveld for some of the wildest places left in Africa. 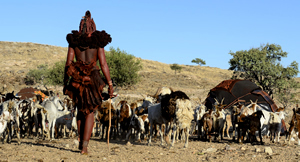 A hard, elemental land of sun, sea, sand and stone, it is nevertheless home to beguiling beautiful landscapes and desert animals as well as the cattle-owning Himba people, made famous by the red ochre pigment they cover their bodies with for protection against the sun. 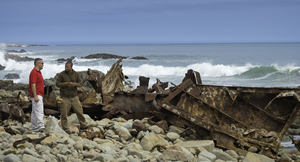 Marked by the ghostly remains of wrecked ships, the Skeleton Coast is a long stretch of treacherous Atlantic coast running from Swakopmund to the Kunene River and Angola border. 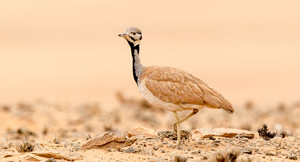 Move inland and you enter the Kaokoveld, the region lying north of Etosha Park and the Kunene – and one of the most sparsely populated places on earth. These two safari regions are usually combined in a fly-in adventure, giving you quick and easy access to remote lodges. 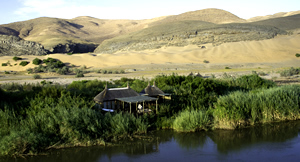 Built to exacting environmental standards, these accommodations offer home-from-home comfort and food, and their specialist guides lead you on walks and drives in search of rare birds, antelope and even giraffe. 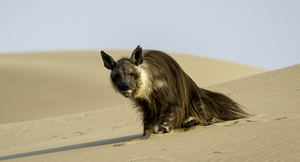 Lions and desert-adapted elephants are occasional sightings but Skeleton Coast seal colonies regularly attract jackal and brown hyena while a secret Kaokoveld river hides some of the most sought-after birds in Southern Africa. It’s best to combine a Skeleton Coast and Kaokoveld safari with Namibia’s other top destinations such as Etosha Park and the Sossusvlei dunes. You’ll enjoy classic game viewing in Etosha as well as all the spectacular imagery of the Namib Desert; shared charter flights take the sting out of the huge distances involved. Note that although Namibia is generally a recommended self-drive destination, the Skeleton Coast and Kaokoveld are most definitely not except for the most well equipped and professionally guided expeditions. 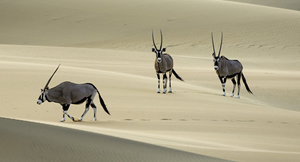 Ask us about a Skeleton Coast and Kaokoveld safari in Namibia. 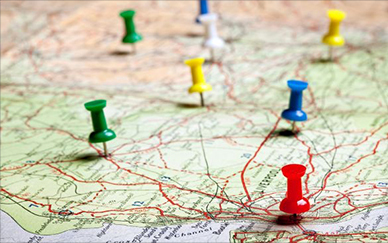 We can recommend the best accommodation for your interests and will package it complete with transfers. And it’s easy to add on a grand finale in the Okavango Delta or Victoria Falls – just ask us how. It’s usually sunny & the ocean is blue but thumping surf & icy water tells you that the Skeleton Coast is best walked! There’s stunning scenery, dramatic seal colonies & the occasional hulk of a shipwreck. The ochre-painted Himba people are the masters of the Kaokoveld but are a fast-vanishing culture – travel with your guide to meet them in their local communities for an unforgettable encounter. The green-fringed Kunene River lies like an oasis in the far northern Kaokoveld attracting birds & animals; stay at Serra Cafema Camp & explore this natural wonderland by 4X4, boat & on foot. Whether it’s lurking brown hyenas at seal colonies, desert antelope in the dunes or nocturnal predators seen on a night drive, there’s more wildlife in these stark regions than you might think. Despite its harsh appearance, the Skeleton Coast is home to over 250 bird species but you’ll have to travel to Serra Cafema in the Kaokoveld for Southern Africa’s rarest bird – the Cinderella Waxbill. 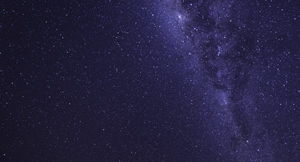 The night skies above the Skeleton Coast & Kaokoveld are some of the clearest & most star-filled you’re likely to see: sit back after supper & take a guided tour around the heavens.